Tomorrow morning we will be setting up shop at St Thomas Episcopal Church in Berea for the Devonshire Tea. It is a lovely event featuring the handcrafted victorian hats, lace gloves, and all of the accouterments of having high tea…. Last year there were several men as doormen, dressed in their finest tux, derby and escorting the women to the hall, which has been transformed into a Victorian Parlor for the day. The soft sounds of a harpist playing, and the flicker of candles. Ah, and Mothers bringing their daughters, the age of manners and chivalry returns. 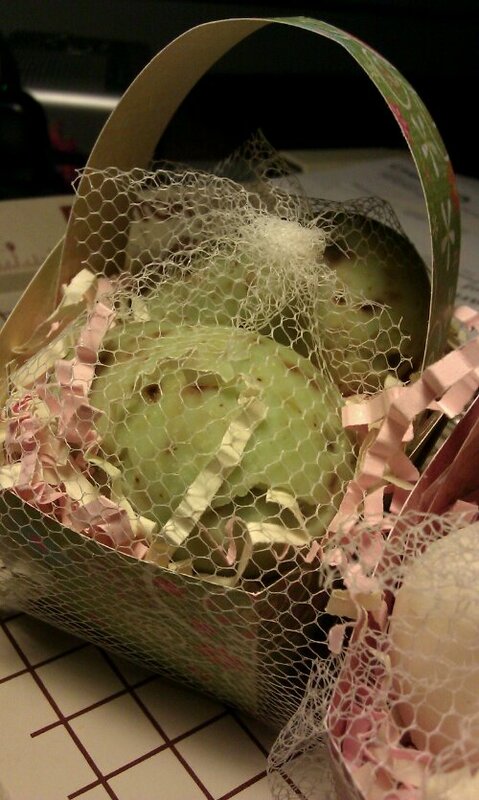 A return of the little baskets of soap eggs for spring is in the works…… here pictured are gardener’s soap. So what is new that we are bringing? A return of our egg shaped soaps, packed in pairs and nested in little pastel paper baskets. They were a popular item last spring, and we have brought them back by popular demand. Each soap is the size of a large egg, and a great size for kids or adults. Gardener soap was our most popular, followed by sweet grass – a earthy sweet grass fragrance reminiscent of fresh cut hay. We sourced out some fun scrapbook cardstock that looks like dotted swiss in pastel yellow, pink, green and blue.